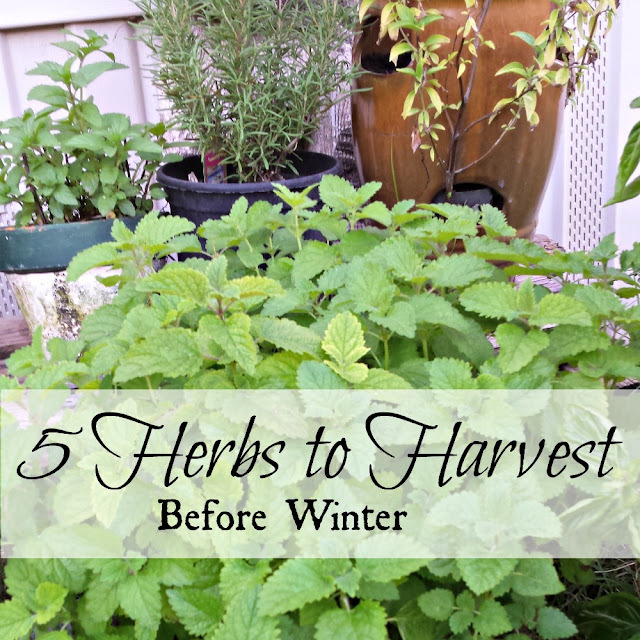 A few days before our first hard freeze, I harvested the herb garden one last time. A month ago I cut back the huge basil plant and dried the leaves in a large bowl, shaking and sifting it daily to move the leaves around so they would dry evenly. Once dried, they filled several jars that I will share with friends. This last harvest won't yield as much but why let the frost take this last gift from the garden? I left the seeds to ripen so I'll have plenty to plant next spring. Homegrown basil smells so incredible, both fresh and dried. Basil seeds in the sun. 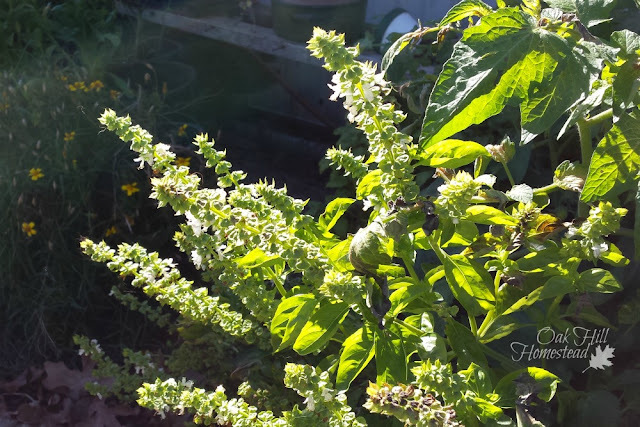 The large lemon balm plant, snuggled up against the basil on one side and a tomato plant at the rear, was protected from the frost except the leaves in front. I moved those aside and cut the leaves that were still vibrant. 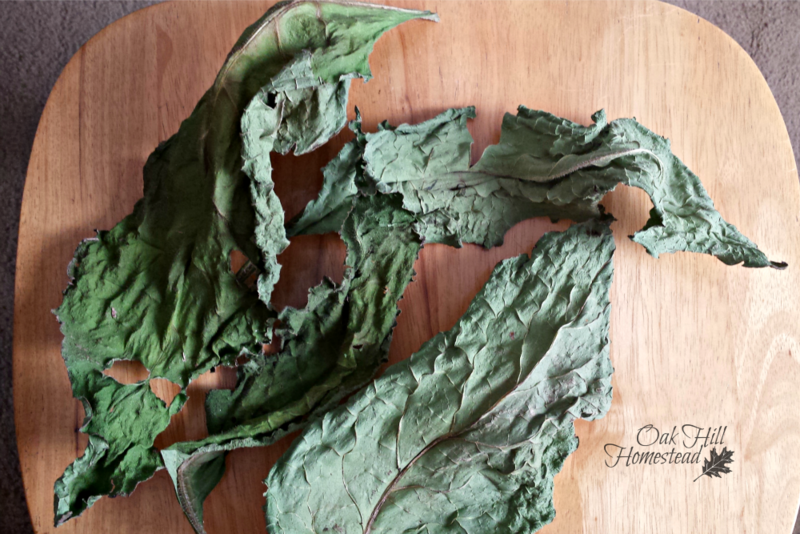 These leaves will also dry easily in a large bowl. I'll just move them around daily like I do the basil. 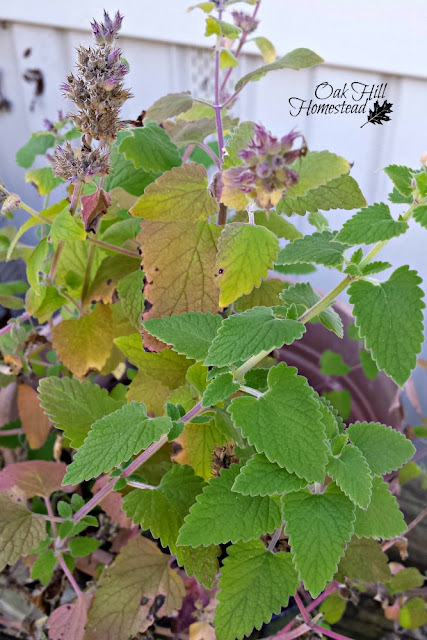 Lemon balm relieves stress, anxiety and sleeplessness; even the lemony scent on my hands after running my hand along a stem of lemon balm is calming. The catnip plant was rather spindly this year but our first light frost didn't hurt it, so I cut those leaves as well. Catnip tea is often used for its calming effects on the mind, body and stomach. One of my indoor cats in particular is absolutely addicted to catnip, so I save a few leaves for him as well. A week ago I cut all the calendula flowers that were in bloom and let them dry. The petals are nearly ready to pull off now. 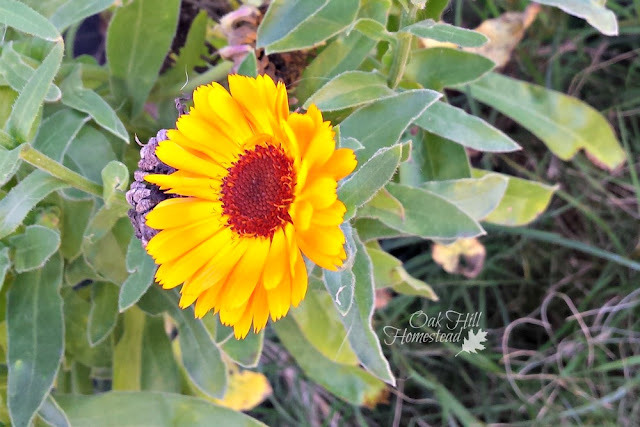 I use calendula-infused oil in my soaps and other personal products. My comfrey plants have grown absolutely huge since I planted them late this summer. Each of these leaves is over twelve inches long. I've been giving the goats a big leaf each once a week or so, and they enjoy them so much they fight over them. I cut off several large leaves last week and have let them dry on a rack, turning them daily. I don't know if the goats will like comfrey as much in dried form but I will offer it to them and see. These dried leaves are on a chair seat, just to give you an idea of how large they are. I'll crumble the rest into a jar and use it as needed this winter. 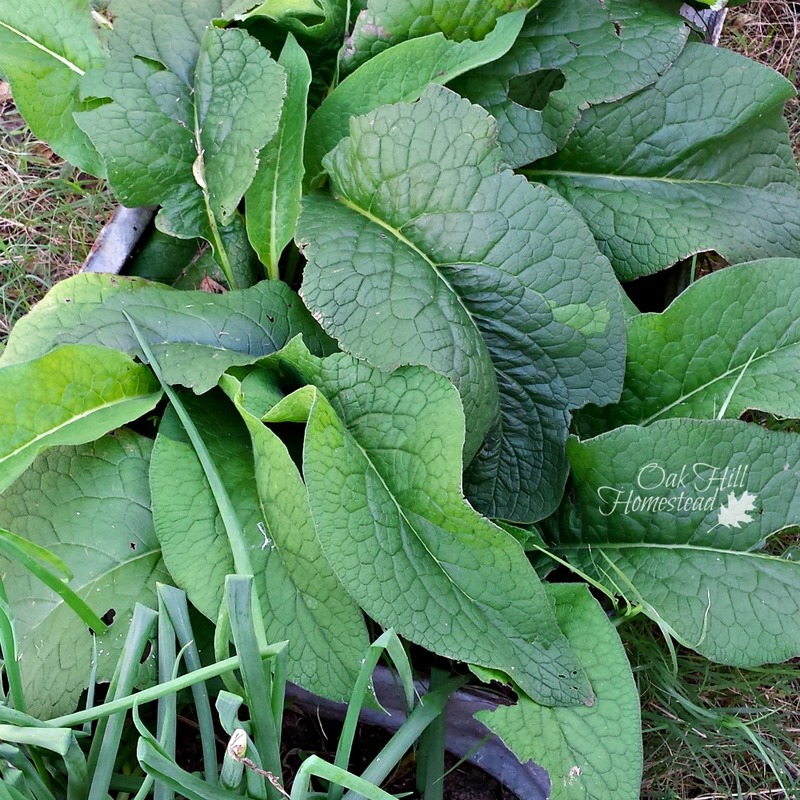 Comfrey is such a wonderful healer on cuts, scrapes and bruises; I make a salve to use on both people and animals. Sunday morning all the plants still in the herb garden were frozen. Hopefully the perennials will be back next year, and I'll certainly be planting the annuals again. 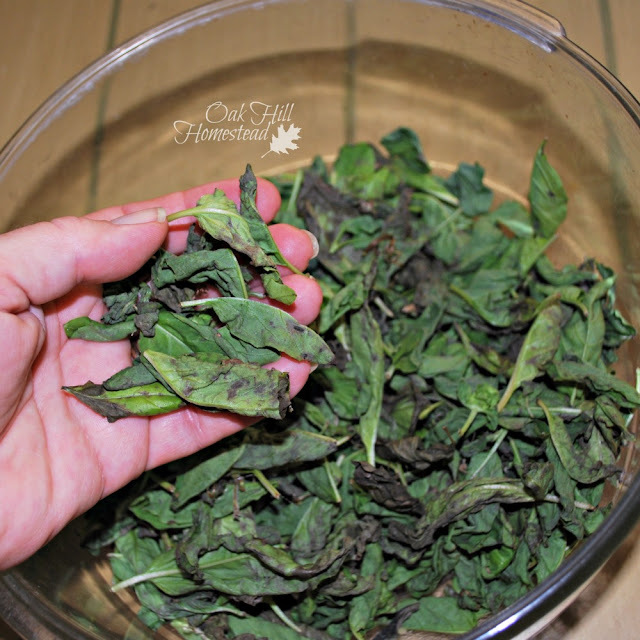 Do you know if indoor basil dies in the winter? I am guessing yes since mine is looking sad right now. Helene, I haven't tried to keep basil over the winter, but since it's an annual it probably is short-lived. Did it produce any seeds you can plant now and keep going over the winter? Very interesting. This is the first year I have done much with herbs. Our first freeze will be Thursday, they think. So I will bring my basil and aloe vera in. The rest are supposed to survive. We will see. Sharing on my fb page. Thank you for sharing the post, Sarah. I can just imagine the aroma coming from all of your cuttings! Mmmm...Thanks for joining us on The Maple Hill Hop! Thank you, Daisy, it does smell good around here. How great to have all these things fresh and handy! I never thought about growing catnip for my cats. Hmmm. Hi Betty. My outside cats aren't interested in catnip but this inside cat - he goes nuts over it and really loves that I grow it for him! Thank you for linking up with the Homestead Blog Hop!! I always love reading your posts. I can't believe how big your Comfrey got. WOW!! I had no idea they'd grow so large, Tracy! I have two others growing in a 4x8' bed; they are easily 3-feet in diameter each! I'm going to have to move the herbs I planted next to them. Good interesting article about herbs. Sharing on twitter and Pinning. Congratulations on being featured on Homestead blog hop.